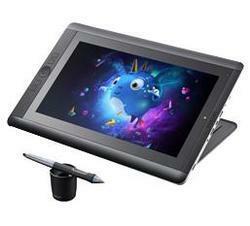 Pioneers in the industry, we offer interactive pen displays, wacom 524 interactive pen displays, pen input only, wacom 2241 and wacom 2242 interactive display from India. 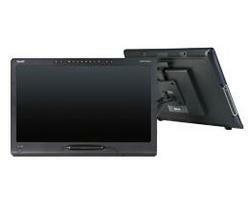 21 7/8" W × 17 3/8" H × 10 2/8"
Supports Windows® operating systems and Mac OS operating system software. The registration document in your product packaging includes instructions for registering your product online, which enables you to download and activate SMART Meeting Pro™ software and SMART Product Drivers for Windows operating systems. Enables you to adjust the incline angle of the interactive pen display from a minimum position of 60° from vertical to a maximum position of 17.5° from vertical. A DVI-D to DVI-D cable, a VGA to DVI-A cable and a USB-A to USB-B cable are included to connect your interactive pen display to your computer. A country-specific AC power cable to connect your interactive pen display to the power supply adapter is also included. You must provide the appropriate cables to connect your product to additional devices. The interactive pen display features an Energy Save mode. 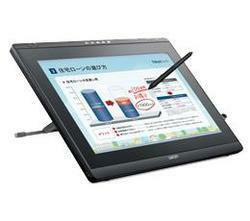 In this mode, the interactive pen display shuts off when it remains idle for the length of time you specify. You can then turn it on by pressing the power button. Enables you to adjust the incline angle of the interactive pen display from a minimum position of 60° from vertical to a maximum position of 13.5° from vertical. 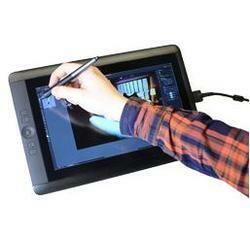 Your interactive pen display has a two-year limited warranty. For details, see the warranty document included in the product packaging. 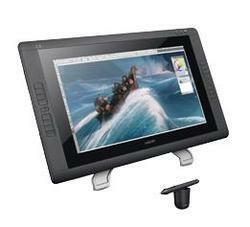 Looking for Wacom Interactive Pen Displays ?